At the initiative of the Islamic Conference Youth Forum for Dialogue and Cooperation (ICYFDC) and Ukrainian Azerbaijani Youth Union (UAYU), February was declared “The month of Khojaly” in Ukraine. The UAYU has organized a meeting on the occasion, where several Ukrainian youth organizations announced that they have joined “Justice for Khojaly” campaign. Speaking at the meeting, chairman of the Union Anar Tahirov briefed the participants on what have been done in several countries of the world since 2008 as part of the “Justice for Khojaly” campaign, initiated by Vice-President of the Heydar Aliyev Foundation Mrs. Leyla Aliyeva. He said these events had great role to increase the awareness of the world community about the genocide committed by Armenians in Khojaly 20 years ago. Tahirov noted as in various countries, Azerbaijani youths in Ukraine also bear great responsibility in this regard. Activists of the Union said at the meeting within the framework of “The month of Khojaly”, a lot of events will be organized in different provinces and cities of Ukraine. Chairwoman of the Ukrainian Youth Assembly, Yuna Sheykhaliyeva and chairman of the Kiev Youth Center, Roman Grigorishin described the events happened in Khojaly as a crime and real genocide against the humanity. 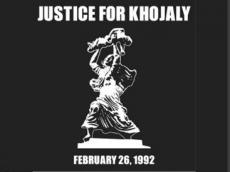 The said their organizations joined “Justice for Khojaly” campaign to raise the awareness of the Ukrainian community about the Khojaly genocide.